A fresh range was added on Friday to the bakery products coming out of the giant Eurofours oven that had been installed in a Behala Silpara workshop two years ago by a Frenchman and a Britisher with the common dream of helping a group of physically challenged orphans earn a living by serving the city with traditional French baked delights. "We are now making madeleines in three new flavours - chocolate chip, chocolate and orange - the recipes of which have been developed over the last few months. We will also be serving mini versions of both madeleines and financiers. We, the French, love these with coffee. Let's see if Calcuttans love them as well," said Lora Chantebel, a business consultant who is here for a year to boost the prospects of the patisserie unit. Madeleines are sponge cakes with a shell-like shape. Financiers contain almond powder and are shaped like ingots. "We grew up with the scent of madeleines in grandma's oven," smiled Lora. The existing range comprises ginger walnut and cinnamon cake, orange and poppy seed cake, chocolate marble cake, chocolate cake and fruit cake. The new cakes, light in sweetness and subtle in flavour, were a run-away hit among the guests at the tasting session organised at the Alliance Francaise du Bengale on Park Street. The packeted products, being a rarity in Calcutta, sold out in no time. "This is an effort to help boys with disabilities find a market. 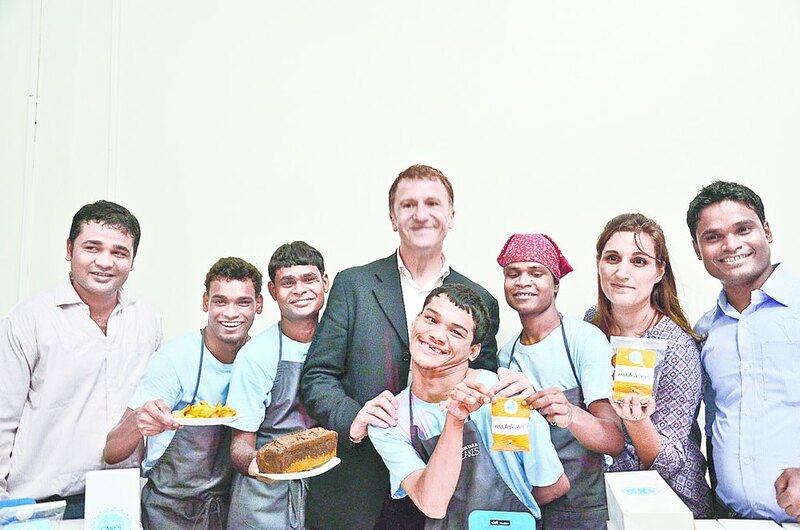 The cakes they are making are healthy and tasty and spread the French pastry tradition in Calcutta," said consul-general of France Fabrice Etienne, while praising the efforts of compatriot Alain Cojean, who runs a foundation called Nourrir Aimer Donner (Eat Love Give). The boys served cakes to the guests and spoke on stage in halting English and in case of Sanjoy Sarkar, a deaf-mute youth, in sign language. Beaming at them was Cojean, who flew down on Friday morning from France to attend the launch, but insisted on being in the sidelines. The French restaurateur had joined hands with British textile dealer David Earp, who had founded Shuktara Home in 1999. Their collaboration has resulted in Shuktara Cakes. The recipes were developed by his friend Fabien Rouillard, a veteran pastry chef who had trained the boys two years ago. "Our main problem in recent times has been dwindling business. The star hotels to which we initially catered backed out as they have their own bakery. Though we do home delivery, the orders are few and far between," said Somnath Sardar, the manager of Shuktara Cakes. Raju Das, who sports a grin broad enough to overshadow his cerebral palsy-stricken mobility problems, is in charge of measurements of the ingredients in the kitchen. "I have known Shuktara to be my home since the age of five. Now thanks to Shuktara Cakes, I am earning about Rs 3000 a month," he said. Sanjoy, who is an expert in releasing financiers from the moulds, has recently married. The other two are Bapi Das, also a deaf-mute, and Ashok Chhetri, whose face and neck are twisted by cerebral palsy. Nonetheless, both are workhorses in the kitchen, with Ashok doing the mixing of ingredients and cleaning of utensils and Bapi carrying heavy loads. "All we need now are distributors," said Lora.